Clinic Synopsis: This clinic will focus on reviewing the fundamentals techniques related to timpani performance. It will look at the creation of proper tone from the instruments related to technique as well as proper intonation. In addition it will review materials suited for the education of the up and coming timpanist and how to improve the performers knowledge of their role in the music. Clinician Biographical Information Tracy Wiggins is coordinator of the percussion program at The University of North Alabama. He has a Doctor of Musical Arts degree from the HARTT School, University of Hartford. 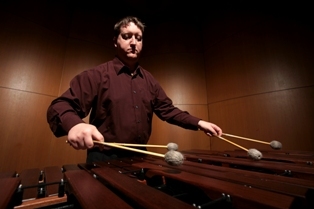 Dr. Wiggins holds a Masters Degree in Percussion Performance from the University of New Mexico and a Bachelors Degree in Music Education from Oklahoma State University. Dr. Wiggins has recently performed as principal timpanist for the Fayetteville Symphony and principal percussionist for the Florence Symphony and the Carolina Philharmonic. He is an artist/endorser for Yamaha Percussion, Innovative Percussion, Black Swamp percussion, Remo Drumheads and Sabian Cymbals.